We are herewith releasing the copy of the letter sent on June 8 to Ms. Sushma Swaraj, Minister of External Affairs by General Secretary, Sitaram Yechury regarding poster released by Overseas Friends of BJP, Malaysia. I am drawing your attention to what I consider as an important issue. I am also doing this in my capacity as a member of the Consultative Committee of the Ministry of External Affairs. Enclosed is a poster released by the OF BJP (Overseas Friends of the BJP) Malaysia. 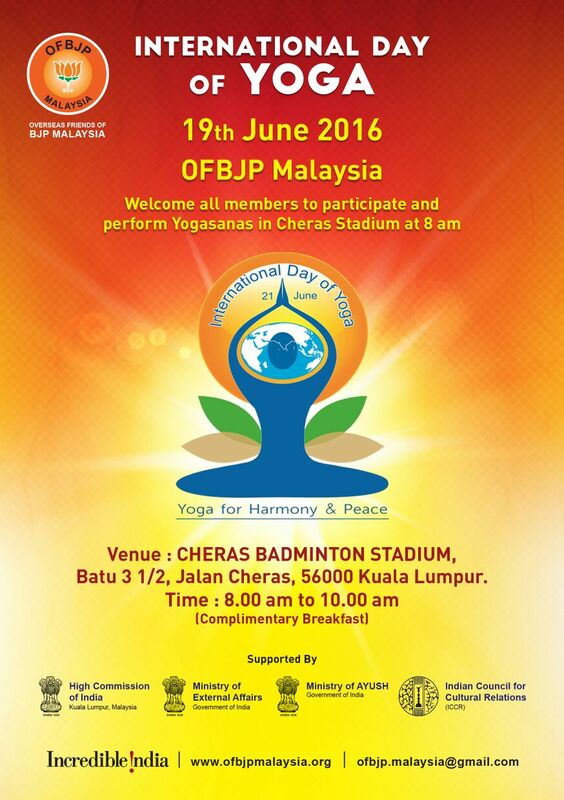 The poster is regarding the observations of the International Day of Yoga on 19th June, 2016. What I find both surprising and objectionable is that the poster declares that this event is being supported by the High Commission of India, Ministry of External Affairs, Ministry of Ayush and the Indian Council of Cultural Relations. Supporting activities abroad that strengthen public opinion in those countries about India and spread goodwill is understandable. But so far as I have known, the Government of India or its Commissions abroad or any of its other arms and institutions do not support the declared activities of political parties abroad. There have been complaints in the past of how the ruling party at the Centre has used subtle methods to promote the activities of their party’s affiliates in these countries. But what we see here is a brazen effort and the public declaration that a voluntary unofficial event is being officially supported by your ministry, its mission in Malaysia and other organisations of the government of India. I think this is a very serious matter that needs to be properly investigated. I would highly appreciate to receive a response from you. If you so consider you may wish to discuss this matter at the next meeting of the Consultative Committee.